Ordering a "grande four-pump, nonfat, no-whip, extra-hot mocha" is a mouthful for any hot beverage nerd, but for deaf people, it can be hard to order just a simple cup of black coffee. Global coffee behemoth Starbucks' "Signing Store Project," launching in Washington, D.C. in October, aims to change that. "Before I go into any store, I'm anticipating and figuring out how I'm going to order and communicate. Typically, it is not an easy or smooth experience," Novsam says. "Sometimes I'll try to lipread, and that often results in misunderstanding my order, especially if they have a question. Sometimes I will gesture for paper and pen and the person will appear annoyed with me or seem exasperated that it is taking extra time." Novsam's personal experience led him to become active in the Starbucks Deaf Leadership group and an advocate for the Signing Store Project's launch in the United States. The new store will be modeled after the first — and only — Starbucks deaf-friendly location in Kuala Lumpur, Malaysia, where ergonomic design, customized order forms and a new queue management system were among the changes that helped create an environment to better serve deaf customers and employees. "Starbucks has always hired the deaf at our stores even before we were planning the signing store," says Rina Siew, Starbucks corporate social responsibility manager for Malaysia. "However, we could only give them very simple and menial tasks. After a while, we realized that we needed to give them a platform where they could actually thrive, and where we as employers can provide a better partner experience for them." The Malaysian store's employees, both deaf and hearing, were enrolled in a 10-week sign language course that also highlighted deaf culture; the Washington, D.C. store will actually focus on hiring staff who are already fluent in American Sign Language (ASL). 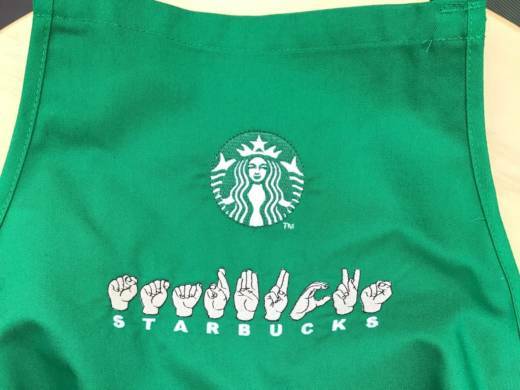 Deaf employees will don a special apron embroidered with ASL symbols, while hearing employees will sport a pin that identifies their proficiency in sign language. But fluency in ASL is only one piece of the puzzle: The physical space is equally important. "Our built environment, largely constructed by and for hearing individuals, presents a variety of surprising challenges to which deaf people have responded with a particular way of altering their surroundings to fit their unique ways of being," says Ryan Maliszewski, director of the Gallaudet Innovation and Entrepreneurship Institute at Gallaudet University, a four-year college for the deaf and hard of hearing in Washington, D.C., located just a few blocks from the planned signing store. Having to rely on their hands for communication, for instance, means that deaf people require more room to simply converse with their friends. Eye strain and what is known as "concentration fatigue" are also common problems, so low-glare surfaces can help create a more comfortable experience. "In addition to spatial and lighting design," says Maliszewski, "mobility, color and acoustics are major elements to consider when identifying opportunities to reduce eye fatigue that can lead to loss of concentration and even physical exhaustion. This not only applies to deaf patrons, but to everyone — including the employees themselves." Alisha Damodaran, senior manger of global corporate communications for Starbucks, notes that existing Starbucks stores already offer several accommodations for the hearing-impaired, including a coffee timer that flashes and vibrates, interpreter services, video remote interpreting and tech pads for writing and visual ordering. Still, she sees the signing stores as part of an ongoing journey, saying, "We plan to leverage these opportunities to gather insights that can apply to the rest of our operations, and over time may look to continued expansion." For Starbucks' employee Novsam, it's also an opportunity to create an experience that is uniquely focused on the deaf community. "We deaf people are often handed Braille menus in restaurants. It doesn't make any sense and you may laugh, but it is a consistent experience for many of us," Novsam says. "I think it will be an awesome experience for hearing people to have a unique experience — having the tables turned a bit — and having the opportunity to be exposed to a new language and culture. I look forward to this store bringing people together."